1. If I’m serious about building a timber frame house, what is the first step I should take? First and foremost, you need to find a plot of land! Allow plenty of time for this, as there is a lot to think about. Find out as much as you can about the plot in advance. Find out whether it is serviced, whether you will be able to get planning permission, what condition the ground is in for drainage, load bearing capacity etc. Check whether there is clear access to the site, whether there are overhead power lines or underground existing main services crossing the site. Gather as much information as you can as early as possible, as poor preparation can prove costly at a later stage. 2. Who designs the building? You need to find a suitable design. This may be something you have done yourself, an idea drawn out on a piece of paper, or you may have found a design from a book of plans or self build literature and websites. Choose a design that will blend into the surroundings, as this will enhance your chances of gaining planning permission. Some local authorities publish useful planning guidelines but consult with your planners throughout the process to get a feel of what they will find acceptable. Again, if you have a clear idea of what you want before you get your plans drawn up, you will save a lot of money on re-designing fees. We thoroughly recommend you use a local architect, not only for the convenience of site visits, but also for their knowledge of local building materials and planning requirements. Where possible, we will gladly recommend anyone we may know in your area, so please feel free to ask. 3. How is the structure designed? Once we have your final, approved plans, we can create the structural design and panel schedule using a specialist timber frame software package from Germany (SEMA). At present we are one of only 2 companies within the UK using this package (See new products for details). 4. Where is the frame made? 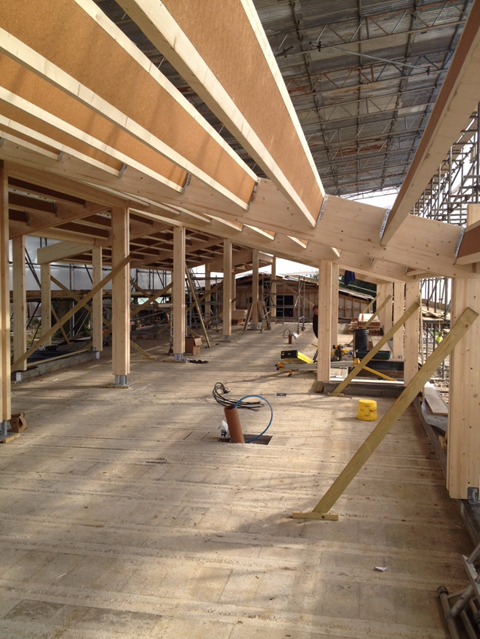 The timber frame structures are made in our factory in Lincolnshire then, subject to site access, transported to the site on the back of 12 metre trailers. 5. What timber do you use and why? CLS Timber, kiln dried wane free whitewood generally from Scandinavia. This is widely regarded amongst timber frame builders as the best quality and most durable timber available and therefore the most appropriate for the job. 6. Who’s responsibility is it to prepare the site? 8. How long does it take to put the timber frame up? This obviously depends on the size of the frame, the resources you have available to you and to a certain extent, the weather conditions. Timber frame does not rely on the weather as much as more traditional techniques, that said, in fair weather, one of our specialist teams would have a typical frame completed anywhere between 7-10 days. 9. Who puts the frame up? You may already have made arrangements yourself to erect the frame, otherwise we will provide a specialist team who will meet the frame at the site, off load and erect it. The finished frame will then be thoroughly checked and signed off to the clients’ satisfaction. 10. How long after the frame is up does it take to finish the house? This really isn’t for us to answer as it can depend on a number of factors, so your organisation and efficiency is vital part of minimising delays. The beauty of timber frame, is that once the frame is up and weather tight, other tradesmen can begin straightaway, both inside and out without getting in each others way!